...and a red Cadillac at that. The only color this guitar came in ! 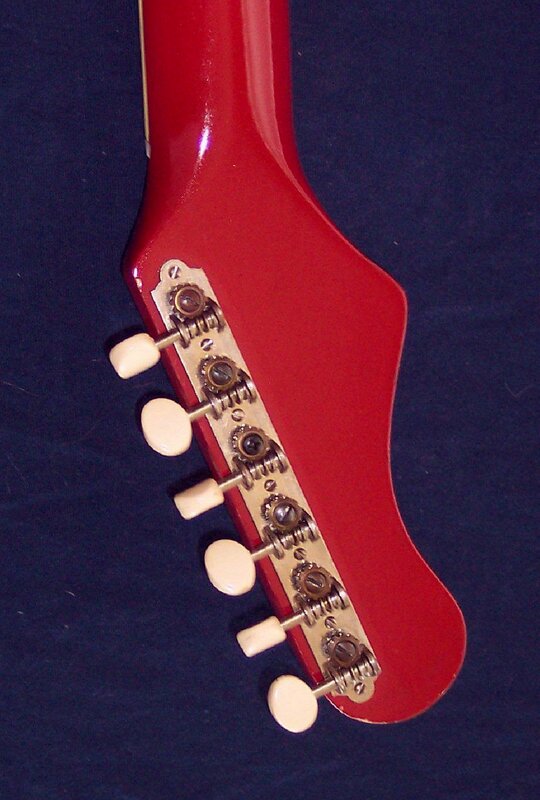 This guitar is extremely rare and in exceptionally Excellent 99% condition. External inspection indicates it would be in Mint condition were it not for a very few minor dings and scuffs. Some Dealers & Collectors would rightfully call it Near Mint. Remarkable. While Moms and Dads were checking out color TV's that had just become widely available / affordable, ....we were over in the guitars section checking out and dreaming about these guitars. How little did we know we'd be drooling and dreaming about them 43 years later ! This tuner gear screw is non-original phillips head. I probably have a correct replacement, and if so I will install it IF a Buyer requests I do so. ( The "don't touch anything unless requested" Industry Standard thang for guitars of this exceptional rarity and quality.